For many years, Indonesians have talked and dreamed of moving their capital. Jakarta, on the island of Java, became the capital when Indonesia declared its independence from the Netherlands in the 1940s. The city, formerly called Batavia, was once an important Dutch colonial port. So nationalist leaders had an easy time agreeing on its home to the new Indonesian government. But since then, Indonesia’s capital has been an unending nightmare for city planners. Jakarta is the world’s second-largest metropolitan area. But it is sinking -- up to 18 centimeters every year. The design of the city and its road system has created a near-permanent traffic jam. The Jakarta Transportation Agency estimates those delays cost the government, businesses and the city’s residents $11 billion a year. 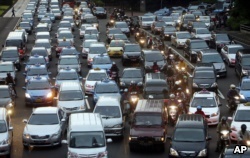 In this Sept. 24, 2010 photo, motorists are stuck in traffic jam during an evening rush hour at the main business district in Jakarta, Indonesia. Yet Jakarta remains Indonesia’s economic center. It is easily the largest city and provides more jobs than anywhere else in the country. The slow improvement of roads, public transportation and other infrastructure has led most Indonesians to wonder whether it is possible to move the capital. In 2017, after years of flooding, Indonesian President Joko Widodo asked for the National Development Planning Agency, or BAPPENAS, to study land on the island of Borneo. The main candidate for a new capital is Palangkaraya, a city in Central Kalimantan province. Years ago, even former president Sukarno imagined the city as Indonesians' capital. Widodo has said little about the project. Yet he admitted on Twitter last year that discussions have begun. The island of Java is the economic and population center of Indonesia, which has over 15,000 islands in all. “Preferably the new capital is in a central location within Indonesia, not too far East or West,” said Brodjonegoro. His comments would rule out Sumatra, the largest island. Sumatra is west of Java and home to several important cities and natural resources. 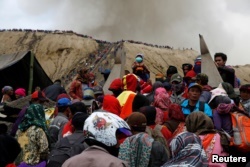 Mount Bromo spews ash as Hindu villagers and visitors gather ahead of Kasada ceremony, when villagers and worshippers throw offerings such as livestock and other crops into the volcanic crater of Mount Bromo, in Probolinggo, Indonesia, July 20, 2016. Indonesia lies on what is known as the “Ring of Fire,” an area with many volcanoes, and where earthquakes are common. However, Borneo is farther away from the tectonic plates that cause most of the earthquakes and volcanic explosions. Last week, the governor of Central Kalimantan said that his province is preparing 500 hectares of land if the government decides to move the capital. Many countries have moved their capitals throughout modern history. One example is the United States. In 1800, the U.S. capital city was moved from Philadelphia to Washington, D.C. In Southeast Asia, Myanmar, also known as Burma, moved its capital from Yangon to Naypyidaw in 2005. In North Africa, Egyptians are building a new capital in the desert outside Cairo. 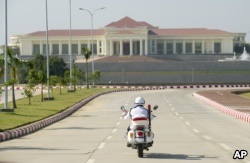 A police motorcycle approaches the President's Office in Naypyidaw, Myanmar, Dec. 1, 2011. 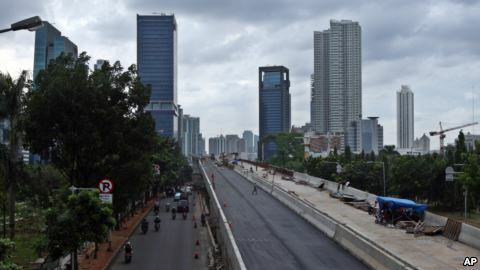 Some critics think the dream of moving Indonesia’s capital is part of a desire by some people to revisit the Sukarno era. Writer Johannes Nugroho believes Indonesians are experiencing a longing for Sukarno and his leadership. The writer added that Sukarno thought Indonesians needed to break with the past and have a fresh start. There would be great economic and geopolitical costs to moving the capital from Java to Kalimantan. Most importantly, Indonesia shares Borneo with Malaysia and Brunei, and the political balance is delicate. Central Kalimantan has very low sea access for a nation of islands. “Political parties would have to move out,” noted Indonesian Vice President Yusuf Kalla last year. “Courts and Supreme Courts would also have to move, aside from the president. Military bases would also have to move. There would be hundreds of thousands who would need housing and offices,” he added. And finally, developing Palangkaraya or a nearby area would cause environmental damage on Borneo. Palm oil and other industries have already cleared land, destroying forests where many animals lived. The island is home to many endangered species, such as the Borneo orangutan. Some Indonesians wonder if relocating the capital may mean simply moving problems from one island to another. I'm Susan Shand and I'm Dorothy Gundy. Krithika Varagur reported this story for VOA. Susan Shand adapted it for Learning Engloish. Mario Ritter was the editor.